My eight-year-old son, Sawyer, takes after me in the fact that neither one of us enjoys eating breakfast first thing in the morning. Instead we both prefer to have a substantial mid-morning snack or light brunch, and we often find ourselves with a bowl of dry cereal and a smoothie during our 10:30 “Homeschool Snack Break.” I whipped up this deceptively decadent (but super healthy!) 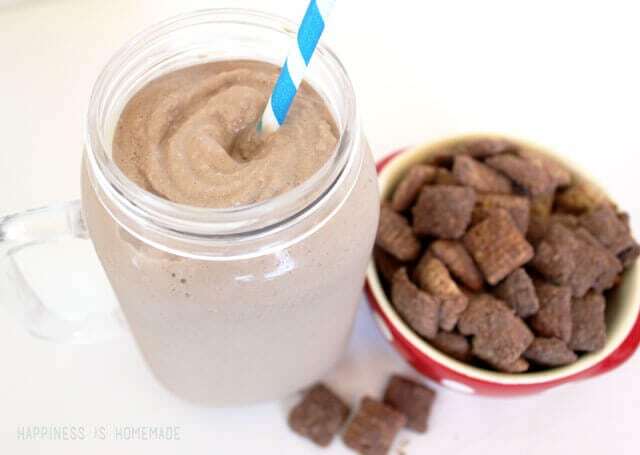 Rich Milk Chocolate breakfast smoothie for us the other day, and my boys went crazy over it – they sucked it down so fast that they were all laughing about getting brain freezes! I was also able to sneak in some greens without them noticing, so I’m calling this recipe a super success for Mom. Note: The photo above is a “pretty picture” of the ingredients, but you’ll want to peel and freeze the banana and the Greek yogurt before making your smoothie if you want it to have a thicker consistency. 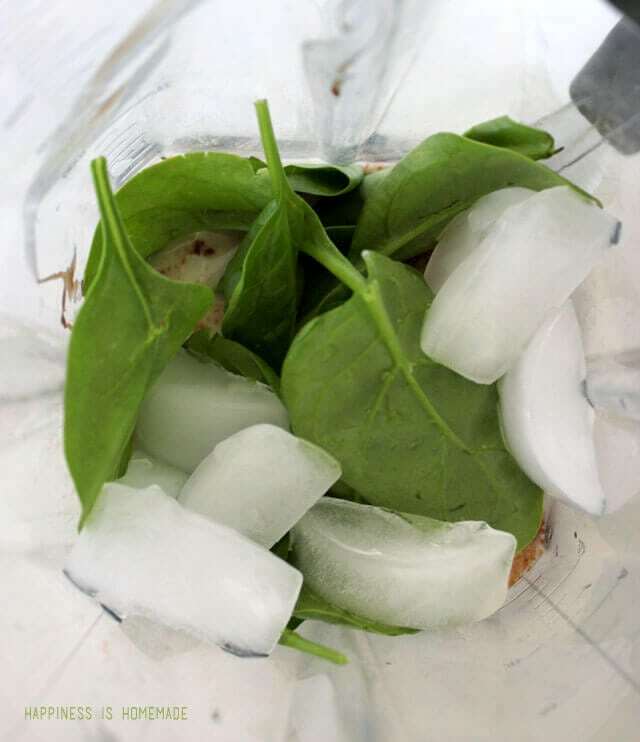 Toss all of the ingredients into a blender in the order listed above, and blend until smooth – easy peasy! It’s so simple that my boys can even make it on their own! Yum! I love that my picky kiddos can’t even detect that there is spinach in there – next time I might try to add even more. 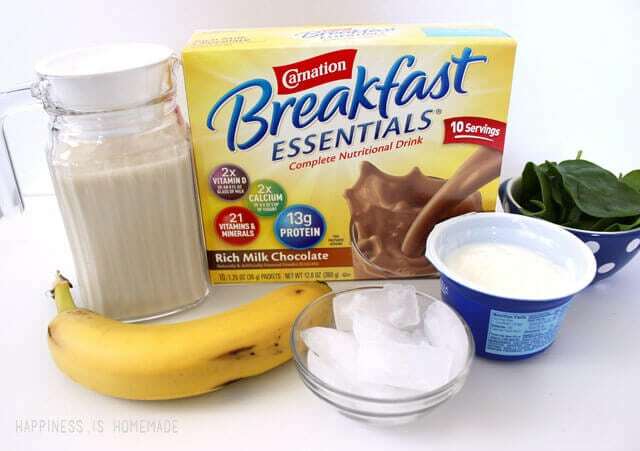 Combine those sneaky greens with the fact that the Carnation Breakfast Essentials is loaded with 21 vitamins and minerals and 13 grams of protein, and I’ve packed a TON of nutrition into something that tastes more like a creamy dessert than a healthy-in-disguise breakfast! 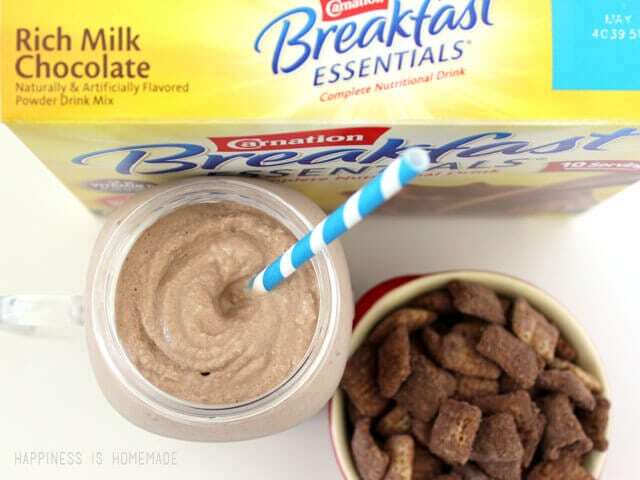 I decided to use the Carnation Breakfast Essentials powder to punch up our usual dry cereal routine, too, and turned it into a tasty Muddy Buddies mix. I simply melted 3 tbsp. of almond butter, drizzled it over 3 cups of rice cereal, mixed until the cereal was coated, and then tossed it with a packet of Rich Milk Chocolate powder. SO easy and yummy! 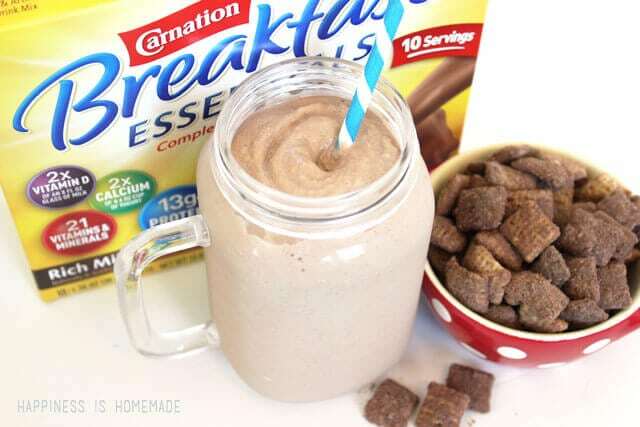 I bet this breakfast smoothie would taste really good with some of the other Carnation Breakfast Essentials flavors, too – French Vanilla, Strawberry Sensation and Chocolate Malt would all be awesome (though I wouldn’t be able to hide the spinach as well in a couple of those, haha!). 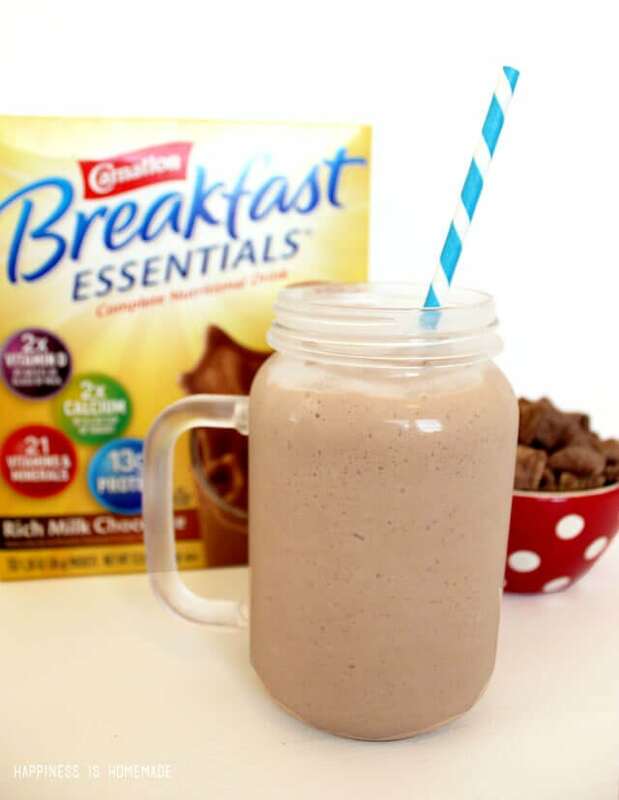 I found a whole bunch more great smoothie and shake recipes on the Carnation Breakfast Essentials website, and I can’t wait to start trying them all! Take a peek, and tell me which one you would try first! YUM! I haven’t tried these breakfast drinks before but I will now!! Looks SOOO good just the way you made it!! Thanks so much for sharing this & the sneaky way to get some greens in your diet!!! This looks yummy! I’m way into frozen drinks and shakes these days. Oh I’m totally going to make that smoothie for my kiddos! Sounds so yummy! Yummy! I’m always looking for more smoothie recipes, especially now that it is summer. Thanks so much!! That looks good. I didn’t think to freeze my yogurt before hand. What a wonderful idea.